In most projects, there are multiple sets of tasks, which have task relationships with one another, taking place at any one time. In an office move project, for example, the facilities manager and her team might be researching new office sites and then working out the lease terms. At the same time, the office manager and his team might be ordering new office furniture and equipment and then arranging for movers. These two sets of activities are not dependent on each other and use different sets of resources. Therefore, they can be scheduled on parallel tracks. There can be any number of sets of tasks on these parallel tracks, or paths, depending on the size and complexity of the project, as well as the number of resources involved. At any time, there's one task that has the latest finish date in the project. This task, along with its predecessors, dictates the finish date of the project as a whole. The finish date of this path is critical to the finish date of the project itself; therefore we call it the critical path. In turn, the tasks that make up each step along the critical path are called the critical tasks. Because the critical path dictates the finish date of the project, we pay a tremendous amount of attention to it in project management. Note The term "critical task" refers only to tasks that are on the "critical path." These terms reflect the scheduling of the tasks, not their relative importance. There can be very important tasks that don't happen to be on the critical path. path is delayed. In this case, the second path might become the critical path if that is now the path with the latest finish date in the project. If you need to bring in the finish date, one of the most effective things you can do is focus on the critical path. If you can make critical tasks along that path finish sooner, you can make the project itself finish sooner. For more information about strategies to bring in a project's finish date, see "Bringing In the Project Finish Date," later in this chapter on page 258. • Free slack is the amount of time a task can slip before it delays another task, typically its successor task. o p • Total slack is the amount of time a task can slip before it delays the project finish date. Note Sometimes you run into a situation in which you have negative slack; that is, the opposite of slack time. An example of negative slack would be when a successor task is due to begin before the predecessor is finished. This can happen when the task duration of a predecessor task conflicts with a successor task that must begin on a date specified by an assigned constraint, for example. Because critical tasks cannot slip without delaying the project finish date, critical tasks have no slack, and tasks with no slack are critical. If a noncritical task consumes its slack time, it usually causes its successor to use some or all of its total slack time. The task becomes a critical task and causes its successor tasks to become critical as well. 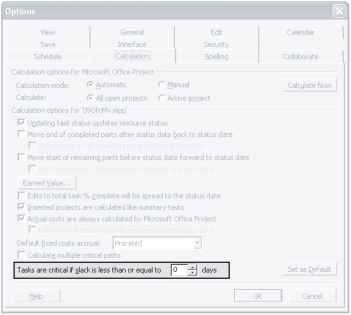 1 Click Tools, Options, and in the Options dialog box, click the Calculation tab. 2 Enter your preference for a critical task in the Tasks Are Critical If Slack Is Less Than Or Equal To box (see Figure 9-2). Figure 9-2. Specify the amount of slack that should define a critical task in your project plan. 1 Click View, Gantt Chart. Or display any other task sheet you want. 2 Click View, Table, Schedule. The Schedule table is applied (see Figure 9-3). You might need to drag the vertical divider to the right to see some of the columns in this table. Figure 9-3. The Schedule table shows free slack and total slack, as well as late start and late finish dates.